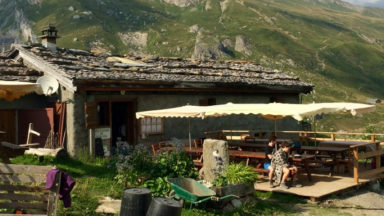 Carroll Dorgan, the author of Cicerone’s guidebook to the GR5 Trail: Benelux and Lorraine, described the highlights of that trail in a previous Cicerone Extra article. 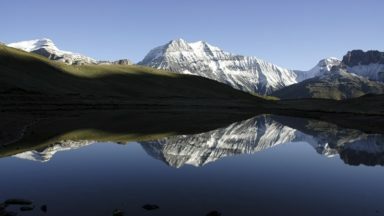 Here, he recounts some of the history that surrounds the trekker on the Northern GR5. 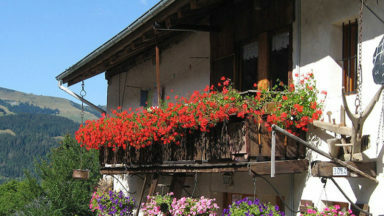 When you visit a place, it is interesting to learn about its history. 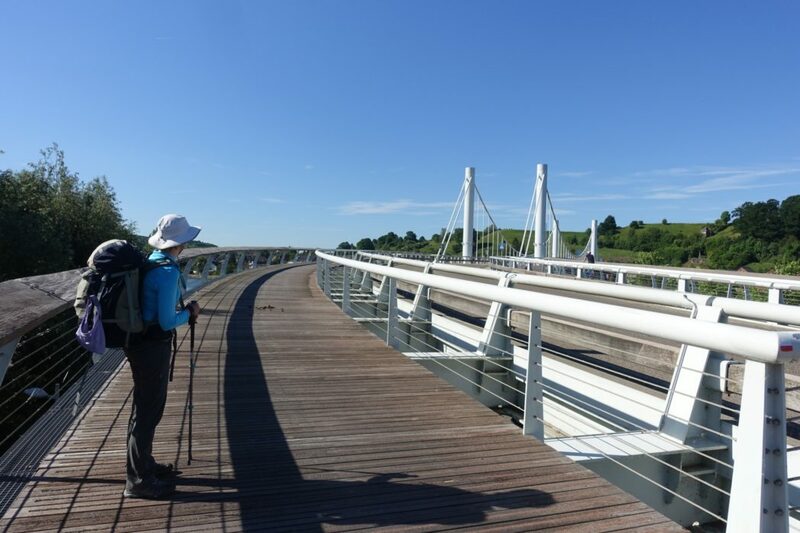 If you walk 1000km along the Northern GR5, across the Delta region of the Netherlands, Flanders and Wallonia in Belgium, eastern Luxembourg and France’s Lorraine, there’s a lot to learn! These countries formed a complex mosaic of territories over the centuries. 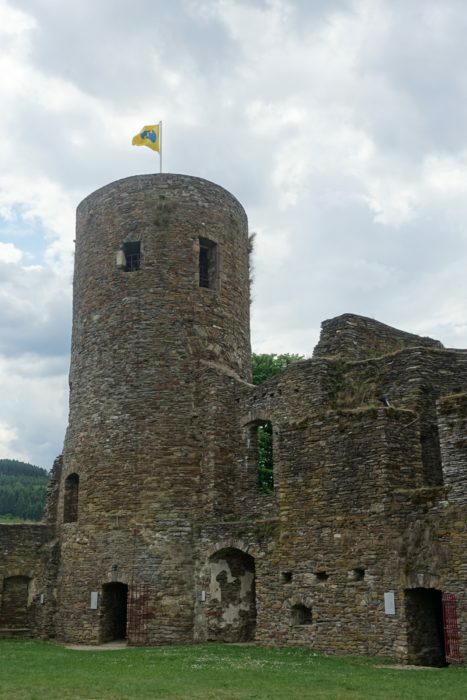 Their strategic location – along major axes of communication, lying between major powers – and their economic development – for example, woollen cloth in the Middle Ages, coal and steel in modern times – have drawn outsiders to the area and sometimes sparked conflicts. 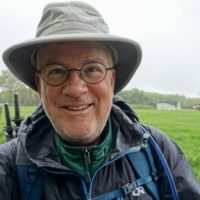 This article describes a few of the historical events and customs that the curious and observant hiker will encounter on this trail. Julius Caesar’s conquest of Gaul in 58-52bc brought the territory of the Northern GR5 into the Roman Empire. Tangible traces of the Roman presence remain beside the GR5. 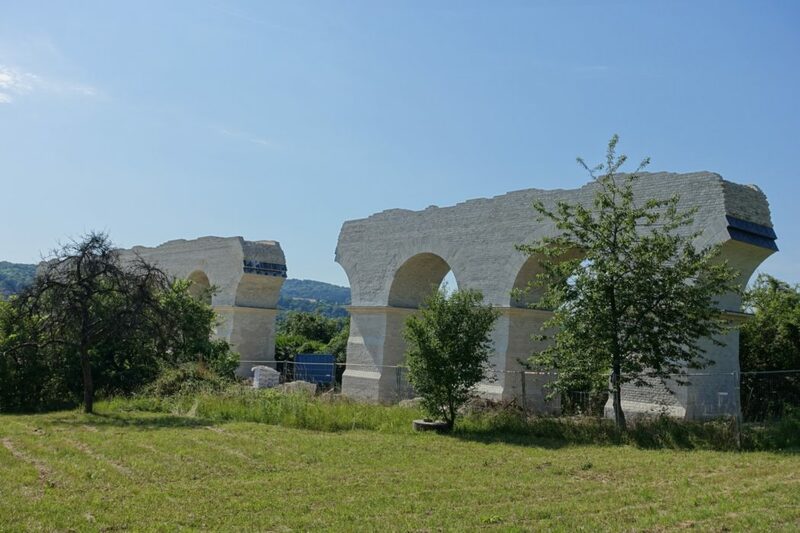 Near Ars-sur-Moselle, you pass the ruins of an impressive 22km aqueduct that supplied water to Divodurum (Metz). 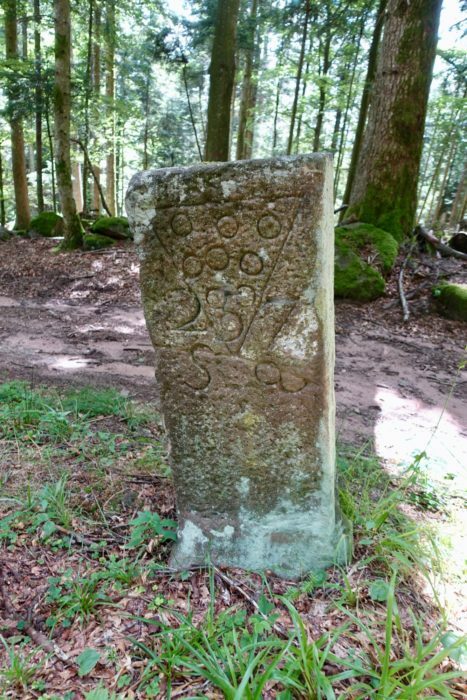 Old milestones (bornes) placed by Roman soldiers still mark the path that climbs towards the summit of Le Donon in the Vosges mountains. There are also important intangible traces. On several occasions, the GR5 crosses the linguistic border between Germanic (Dutch, Flemish, German, Lëtzebuergesch, Platt) and Romance (French, Walloon) languages that date back to the settlement of Germanic people in border areas of the Roman Empire. Today’s Benelux and Lorraine lie in the heart of Charlemagne’s empire. When that empire was divided between three of Charlemagne’s grandsons in 843, the broad swathe of land in the middle stretching from the North Sea to northern Italy – Middle Francia – was granted to Lothar. A later division of these lands (in 855) gave the northern part of Middle Francia to Lothar’s son, Lothar II. This short-lived kingdom became known as Lotharingia or, in French, Lorraine. Charles’ son Philip II succeeded him as King of Spain (while Charles’ brother Ferdinand became emperor). Among his titles, Philip was King of England (1554-1558) by virtue of his marriage to Queen Mary. Philip’s harsh rule over the Low Countries provoked a revolt that (after a war lasting 80 years) led to the independence of the United Provinces of the Netherlands. 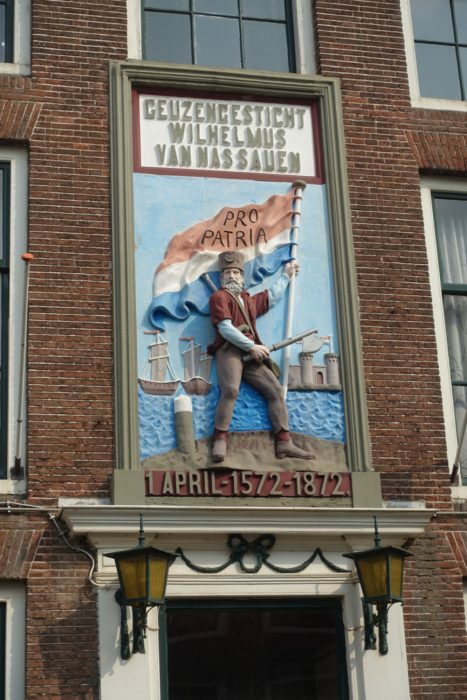 The GR5 passes through Brielle, the city whose dramatic capture by the watergeuzen (sea beggars) in 1572 gave impetus to the Dutch revolt against Spanish rule. The Dutch created a commercial empire during their Golden Age in the 17th century. However, the rising power of France under King Louis XIV was a mortal threat to the Dutch Republic. In 1672, French troops nearly overran the Netherlands, but were stopped when the Dutch opened dykes and flooded vast expanses of their country. The following year, the French (with English support) besieged Maastricht. Entering Maastricht on the GR5, you will walk on the ramparts (Hoge Fronten) that failed to prevent the capitulation of the city. 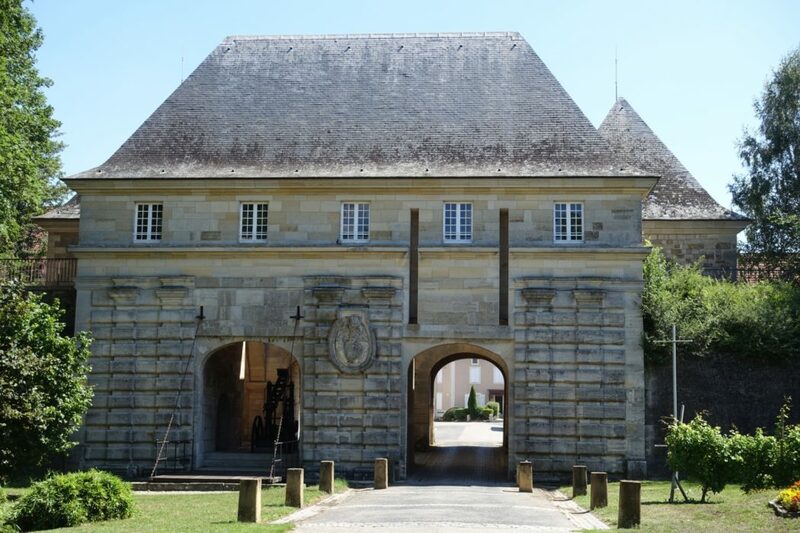 Charles Ogier de Batz de Castelmore, Comte d’Artagnan (the inspiration for Alexandre Dumas’ d’Artagnan in The Three Musketeers), was killed upon the ramparts during this siege. Fighting with the Comte d’Artagnan that day was young John Churchill, the future Duke of Marlborough. I am the Rabbit of Olland! The Napoleonic Empire encompassed all of the territory covered by the GR5 (and much more, of course). Napoleon placed his brothers to rule as kings over some of those territories. For example, Louis Bonaparte became King of the Netherlands in 1806. However, Louis did not serve French interests to the satisfaction of his brother; he identified with his Dutch subjects. He tried to learn Dutch and once announced that he was the Konijn van Olland (which means Rabbit of Olland), when he meant to say Koning van Holland (King of Holland). This error probably did not bother his brother, but Napoleon was displeased by Louis’ failure to enforce the Continental System against Britain (unpopular in Holland). Napoleon removed Louis in 1810 and annexed the Netherlands into the French Empire. 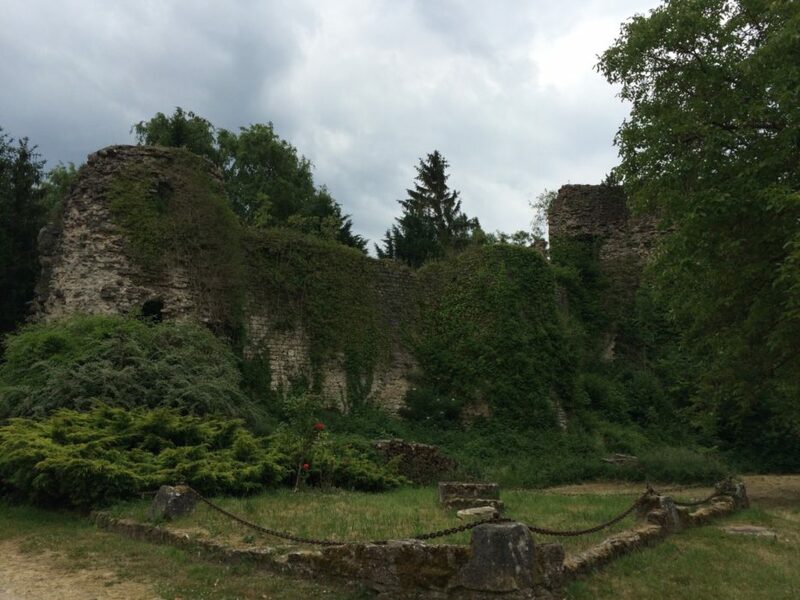 If you leave the GR5 in Herkingen to walk a short distance to the town’s excellent B&B, you will pass an old shelter, the visbank, where a sign recalls King Louis’ visit to the town in 1809 and his gift of 2000 guilders to the local church for the repayment of its debts. When Prussia defeated France in 1871, it seized most of Alsace and part of Lorraine and incorporated those territories in the newly established German Empire. 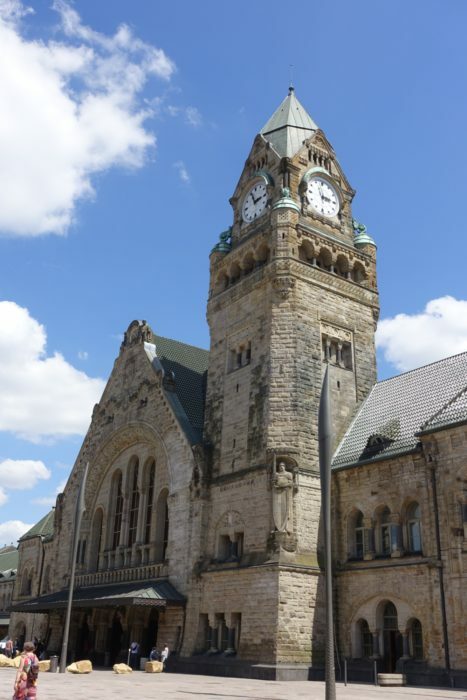 France recovered the lost territories after the defeat of Germany in World War I. Traces of German rule over northern Lorraine (today’s Moselle Department) remain, such as the neo-Romanesque train station (reflecting Kaiser Wilhelm II’s architectural taste) in Metz and boundary stones (bornes frontalières) along the GR5 southeast of Gorze that marked the border between France and Germany from 1871 to 1918. 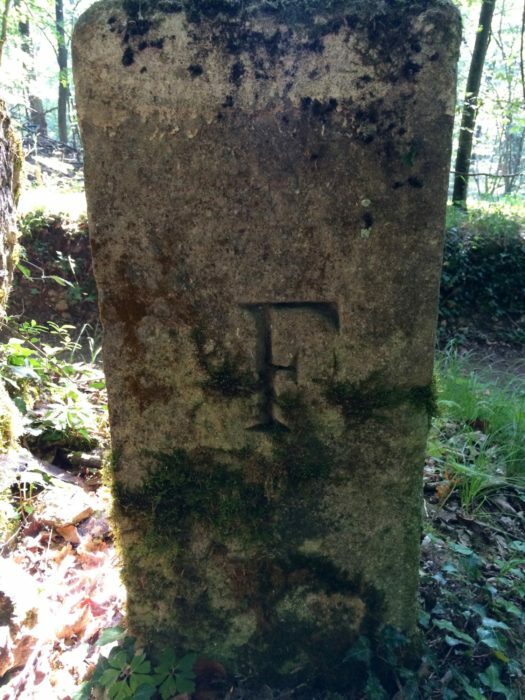 An F (for France) is carved into the western side of each stone. 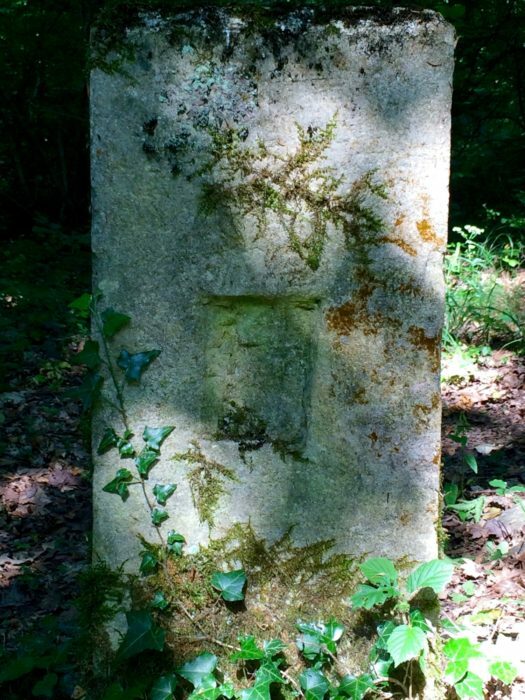 Each D (for Deutschland) that once marked the eastern side has been chiselled out. The rivalries of emperors, kings and lesser potentates naturally left military architecture scattered around the area. 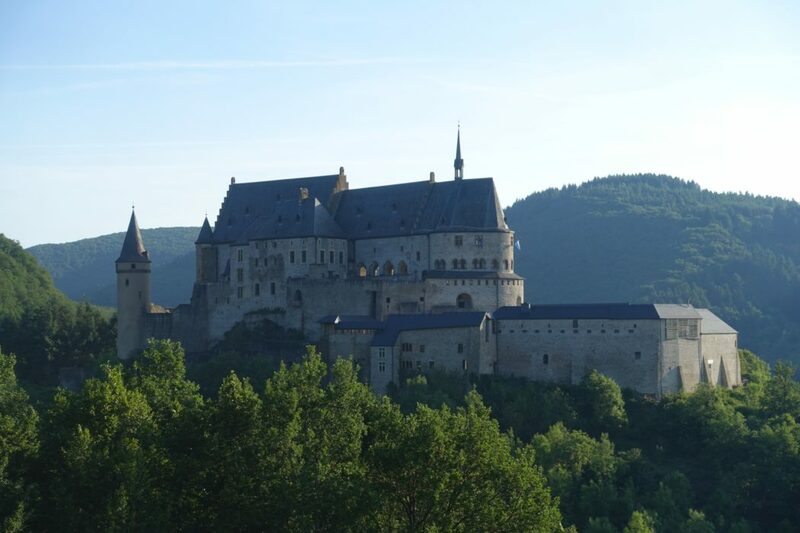 As you walk along the GR5, you will encounter several medieval castles. 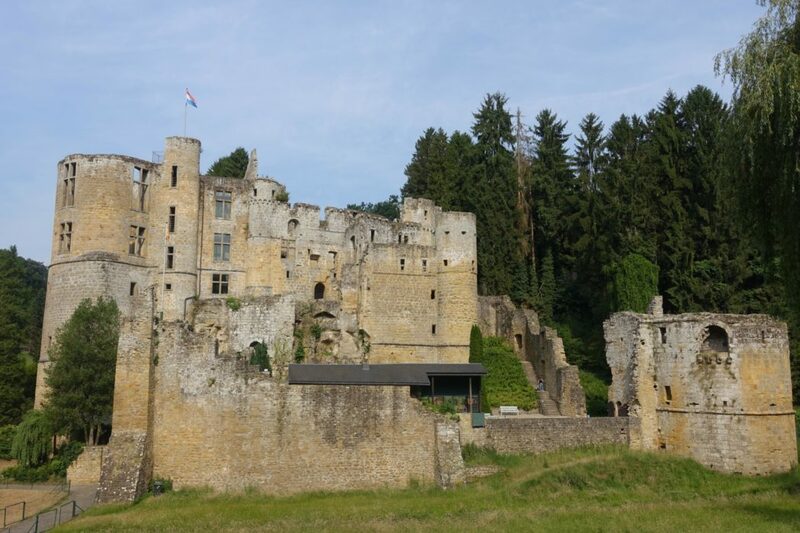 Some are restored, such as Vianden and Beaufort (Luxembourg); others lie in picturesque ruins, such as Burg Reuland (Wallonia) and Prény (Lorraine). The new trends in military architecture prompted by advances in artillery are apparent in earthen ramparts that still surround parts of Brielle and Maastricht. Fort De Roovere near Bergen op Zoom (built in 1628) is now just a collection of low, grass-covered mounds, but it is fun to follow the GR5 through those ruins as it crosses a moat in an open wooden structure that is mostly below the level of the water. It’s called the Moses Bridge. Modern fortifications are less picturesque than medieval castles, and they evoke the horrors of industrial warfare during the 20th century. The GR5 passes close to Fort Evegnée, one of 12 forts that were built in the late 19th century to protect Liège. The heroic, but doomed, resistance of these forts at the beginning of the German offensive in August 1914 inspired the French to change the name of a popular dessert from café viennois to café liégeois. 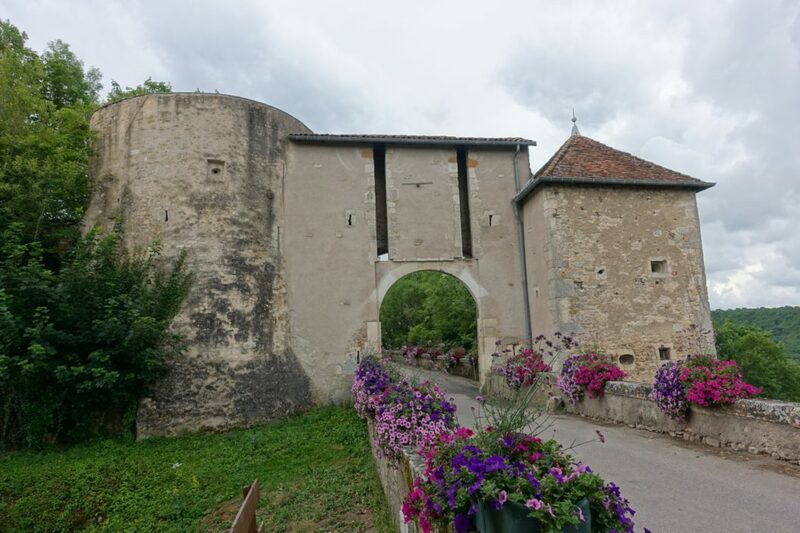 The French fortified their eastern border in the 1930s with the Maginot Line in order to prevent a repetition of the horrors of trench warfare. 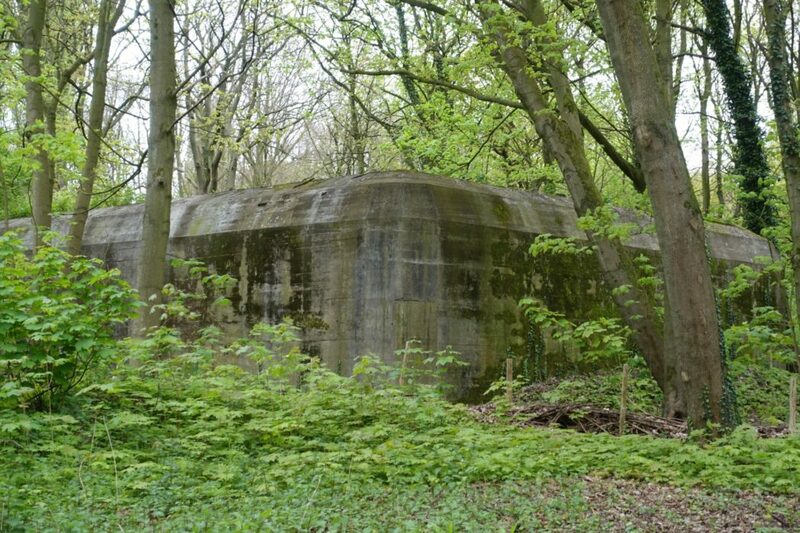 Buried bunkers with armoured cupulas – outlying elements of the big Hackenburg fort northeast of Metz – still stand silently beside the GR5. 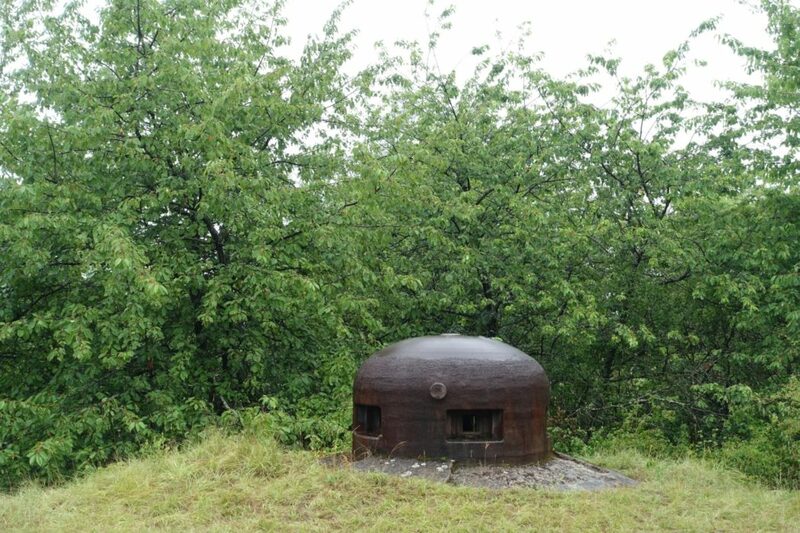 The German Army avoided the Maginot Line by attacking through the Ardennes in May 1940. 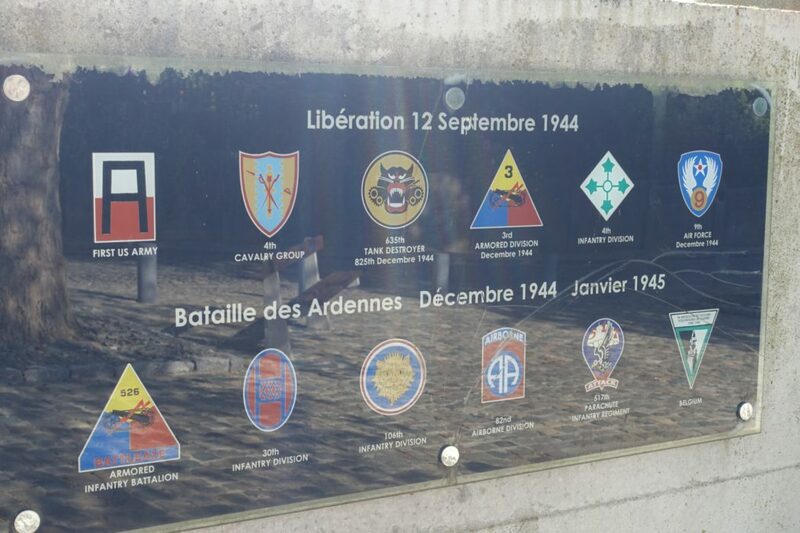 Then in December 1944, the Germans launched a surprise attack in the Ardennes that led to the Battle of the Bulge. 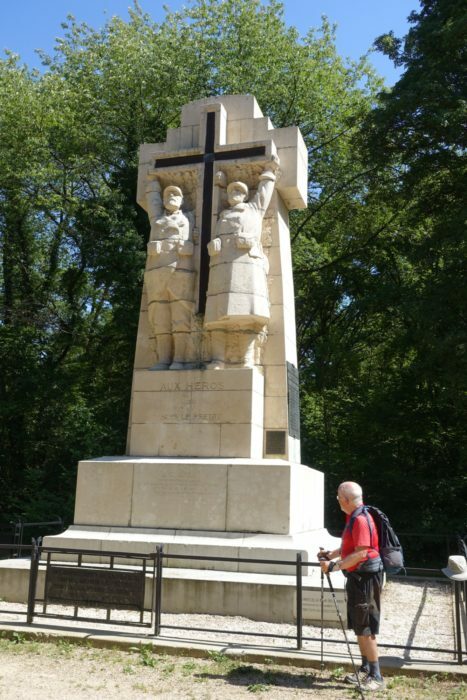 In Stavelot and elsewhere along the GR5 in that area, you will see memorials to that bloody battle. Turning your back (figuratively, at least) on military history, you can appreciate the notable religious architecture along the GR5, ranging from the modest churches in just about every village to the spectacular Saint-Etienne Cathedral in Metz, with a nave that soars above 40 metres and stained-glass windows that incorporate works by medieval and renaissance artists, as well as modern ones such as Chagall. 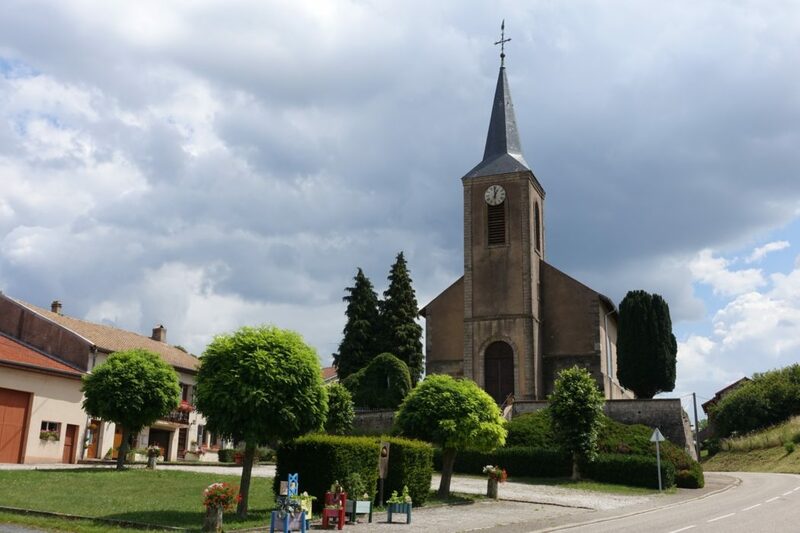 There are also little gems such as the baroque church in Saint-Quirin (near the end of the GR5’s route through Lorraine), with its restored 18th century Silberman organ. 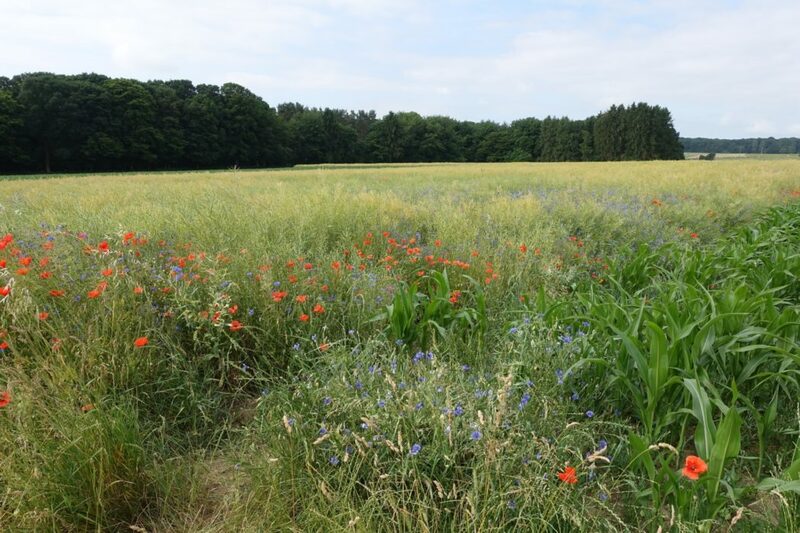 The area in northern Flanders that the GR5 crosses is the Kempen. 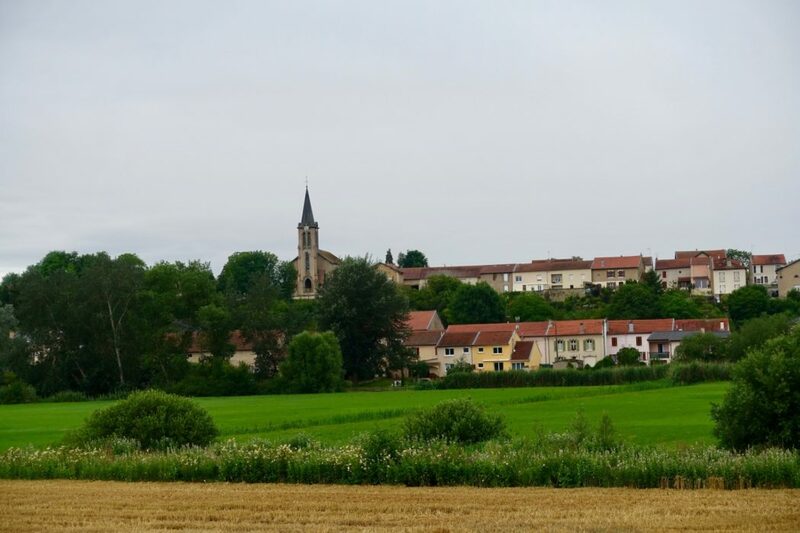 In the past, it was a remote, poor area with few natural resources – making it an attractive area for the foundation of abbeys. 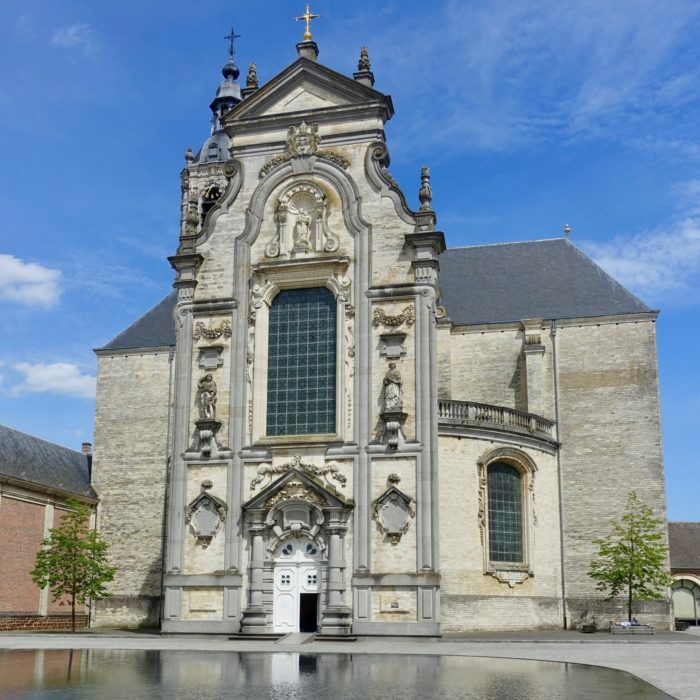 Among the several great Flemish abbeys passed by the GR5 is Herkenrode, which was founded in 1179 and transformed into a Cistercian nunnery in 1217. The nunnery became an important pilgrimage site, owing in part to its acquisition of relics of St Ursula and her 11,000 virgins. 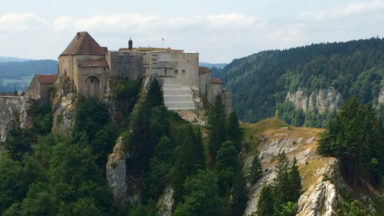 In 1796, French Revolutionary forces closed the abbey and expelled its nuns. 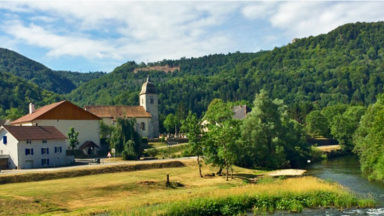 The French then sold the abbey and its furnishings. Herkenrode’s stained glass windows, purchased by an English buyer, are now among the Treasures of Lichfield Cathedral in England. The Dutch like to say that, while God created the earth, they created the Netherlands. (‘God schiep de aarde, maar de Nederlanders schiepen Nederland.’) Indeed, just about everywhere you walk on the GR5 in the Delta region of the Netherlands, you are surrounded by the works of land reclamation (polders) and water management. 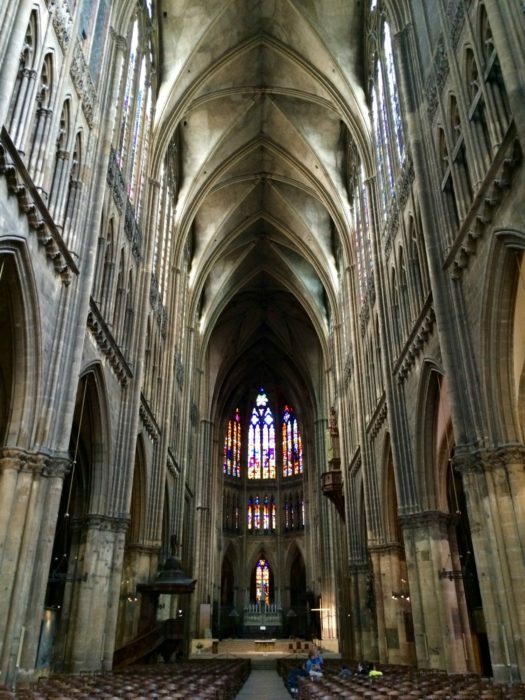 Some of these date back centuries. 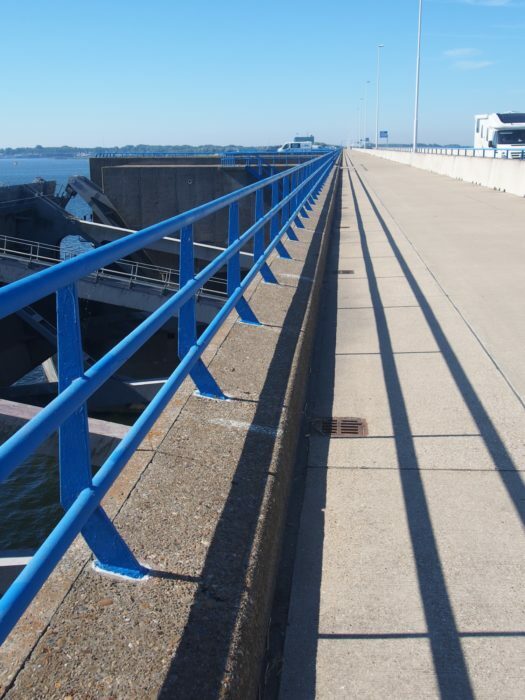 Water boards that were established to co-ordinate the construction and maintenance of dykes and drainage systems are the earliest form of democratic government in the Netherlands. The Hoogheemraadschap van Rijnland, established in 1232, is now the oldest water authority still in operation. 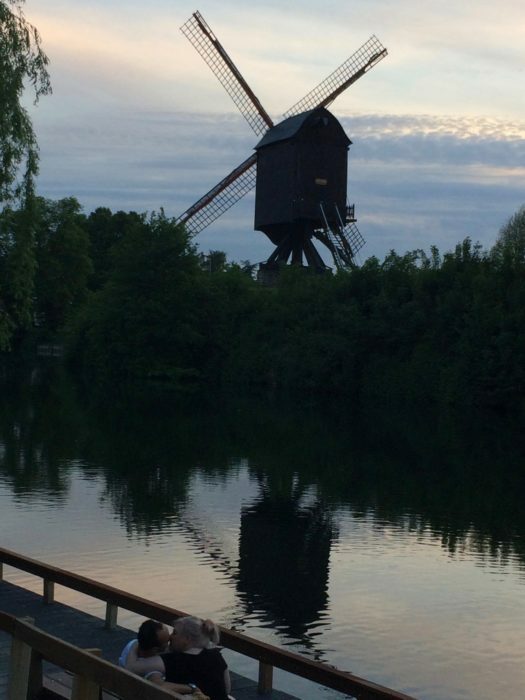 The picturesque, traditional windmills that symbolise the Netherlands were used principally to pump water and grind grain. 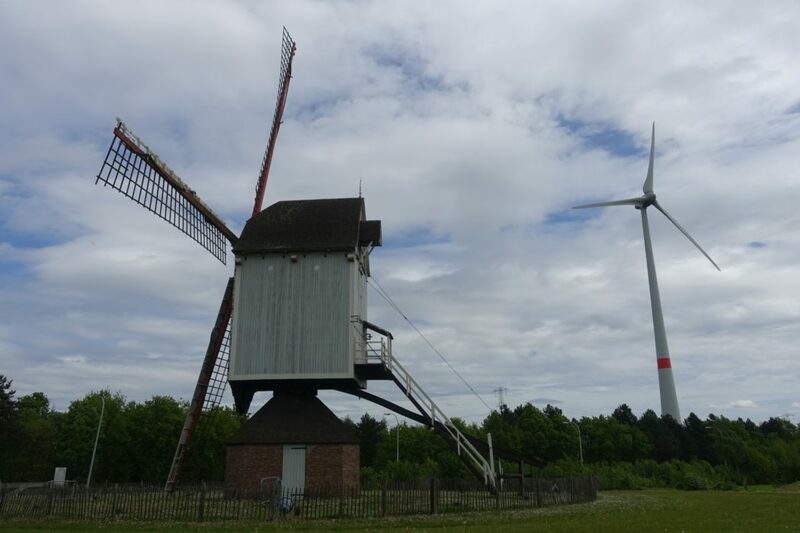 Modern turbines now harness the wind to produce electricity; in 2017, wind power in the Netherlands produced more than 9.6 billion kWh. The GR5 passes a new wind park beside the Krammersluizen between Herkingen and Nieuw Vossemeer, where 34 wind turbines are being built (scheduled for completion in 2019). 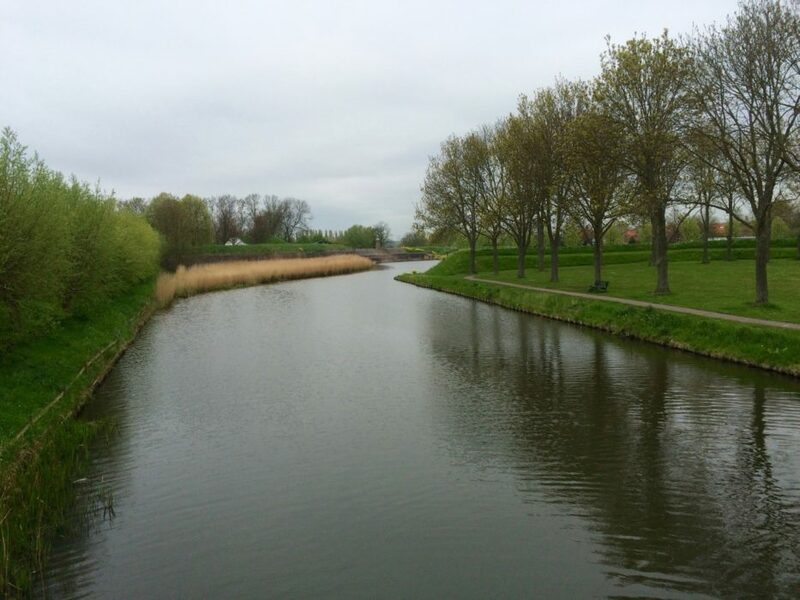 The Dutch (and the Belgians) not only created land, they also constructed waterways. 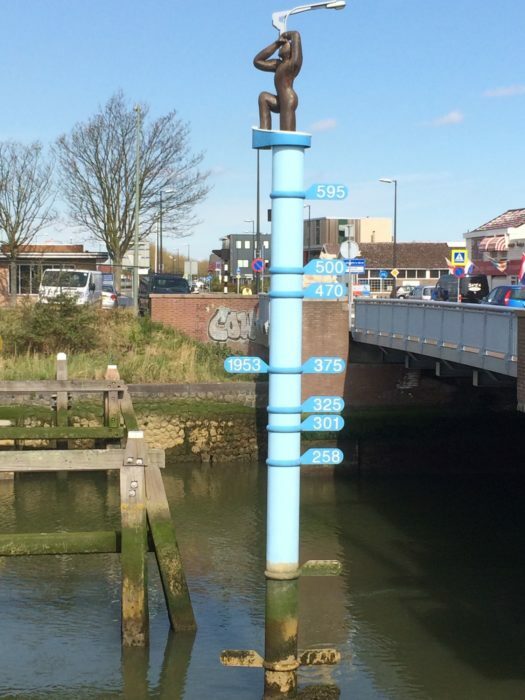 Shortly after leaving Hoek van Holland, you will take a small ferry to cross the Nieuwe Waterweg, the New Waterway, which was completed in 1872 in order to connect Rotterdam to the North Sea as the Rijn (Rhine) and Maas (Meuse) rivers silted up. In Belgium, the Albert Canal was built in the 1930s to link the industrial area around Liège with Antwerp; the GR5 crosses that canal six times. 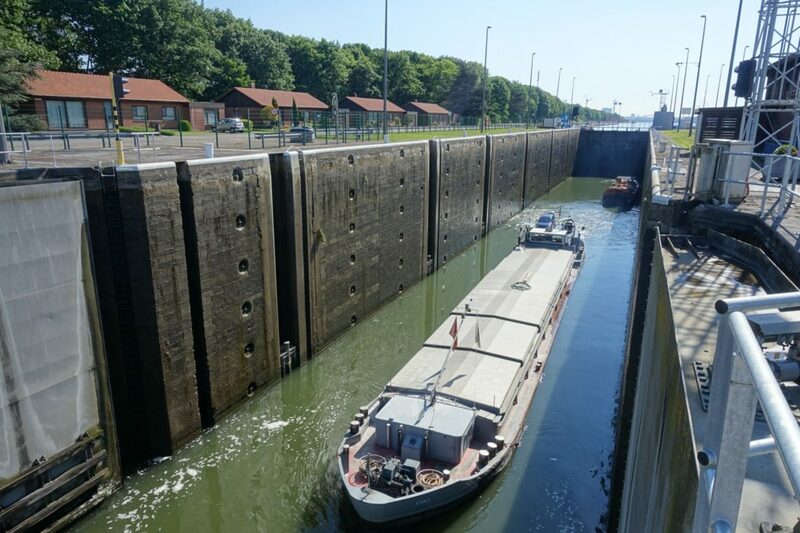 In Lorraine, the GR5 follows the Canal des Houillères, built in the 1860s to transport coal from mines in Saarbrücken (and now used by recreational craft). After walking through Brielle and the beautiful dunes of Voornes Duin, you cross the Haringvlietsluizen, which links Voorne and Goeree-Overflakkee islands. 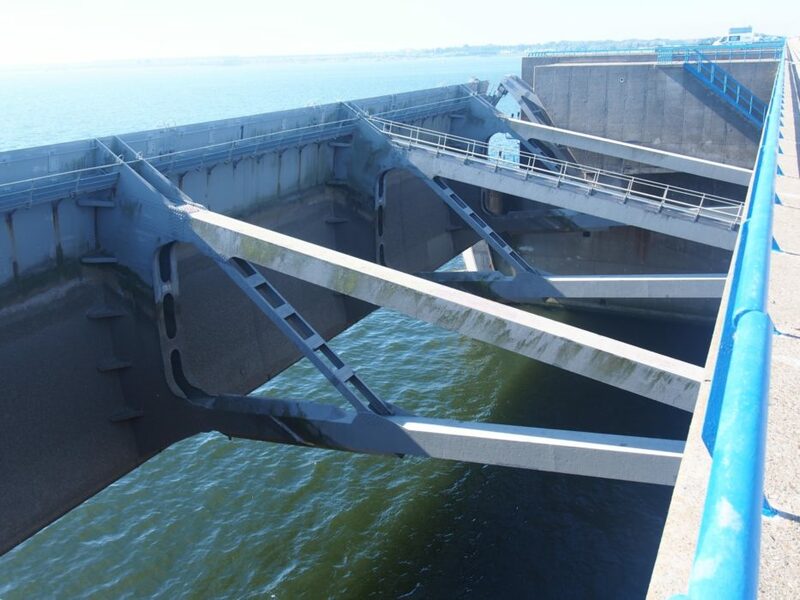 The Haringvlietsluizen, with 17 large sluice gates, is one of the major elements of the Delta Project, the network of dams, sluices, locks, storm surge barriers and dykes that the Dutch built over a period of 40 years after the watersnoodramp (flood disaster) in 1953, during which 1836 people died, some 3000 houses and 300 farms were destroyed and many more damaged. 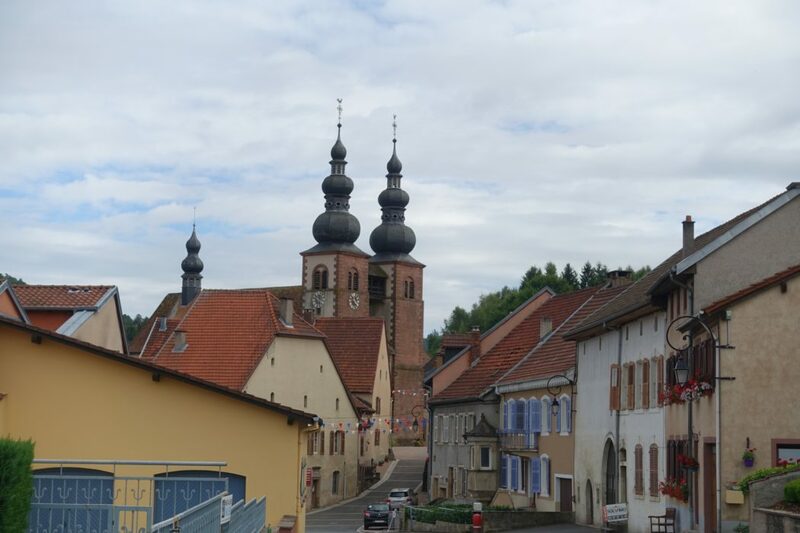 As you walk on the GR5 across the rolling countryside of Lorraine from the Moselle river toward the Vosges mountains, you pass places with names that evoke the area’s long history of salt production, such as Marsal. This is the Pays du Sel (salt country). In prehistoric times, people produced salt here from subterranean deposits of brine, using a technique called briquetage. They heated the brine in earthenware vessels and, when the water had evaporated, they broke the vessels to obtain the salt that had been left as a deposit. Enormous piles of broken earthenware accumulated, in some places 10 metres deep, forming foundations for settlements in marshlands. As more efficient means of producing salt were developed, the transport and sale of this vital commodity became a major commercial activity that was avidly controlled and taxed by secular and religious authorities. The gabelle was a particularly onerous and unfairly-assessed tax on salt that helped to provoke the French Revolution. The Low Countries, especially Flanders and Brabant, prospered in the Middle Ages. They imported wool from England and produced fine cloth that was sold throughout Europe. Many cities built beautiful cloth halls to house stalls for their sale and storage. 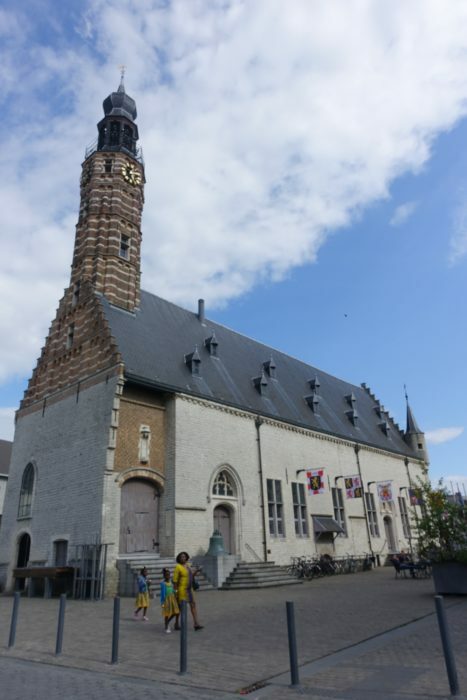 Entering the centre of Herentals, you will see one of these buildings, the gothic Lakenhal (built in the 15th century and rebuilt after a fire in the 16th century). Another Belgian region, Wallonia, led the Continent in industrial development during the 19th century, using techniques imported from Britain to exploit coal and iron resources and to develop manufacturing. 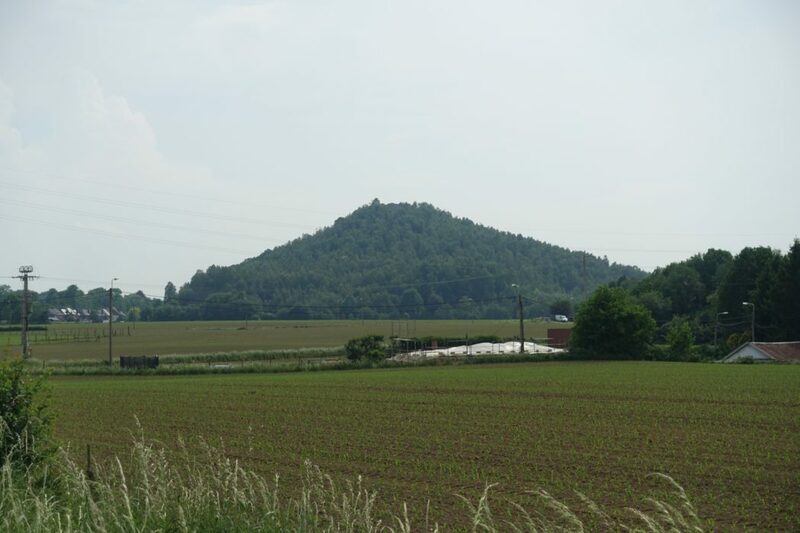 Today, the coal mines and most of the steel mills have closed, but large, cone-shaped slag heaps remind the visitor of Wallonia’s mining heritage. Near Evegnée-Tignée, the GR5 meets the Sentier des Terrils (the slag heap trail), which crosses Wallonia. Its designation, GR412, refers obliquely to St Barbara, the patron saint of miners, whose feast day is 4 December. 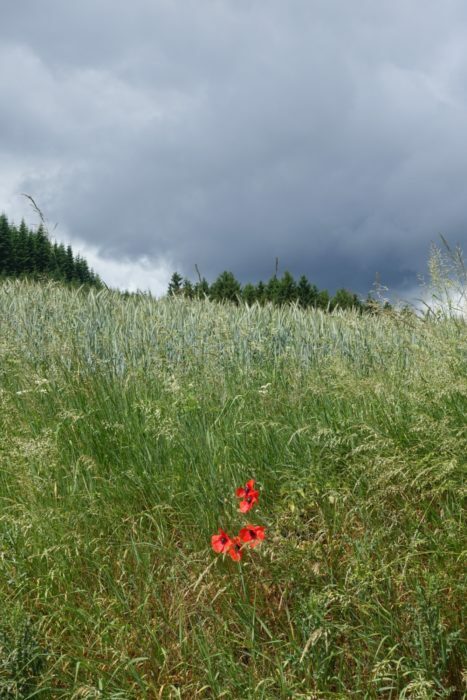 Bright red poppies in green fields beside the GR5 evoke the sacrifices and losses in the armed conflicts that have scarred the Benelux and Lorraine. 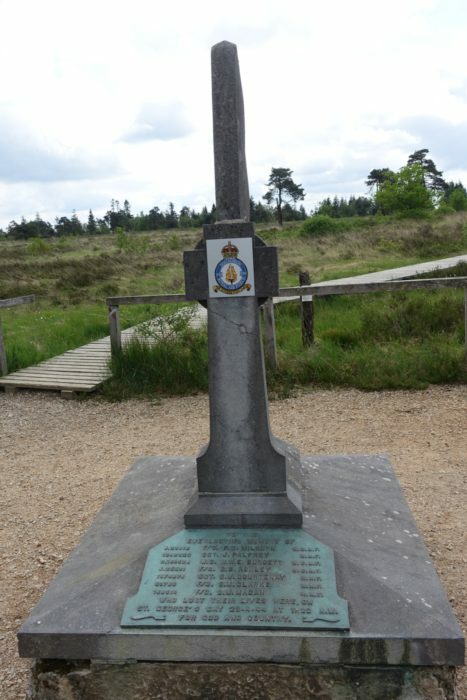 Permanent memorials abound, as well, such as village monuments with the names of soldiers who were killed during those wars. 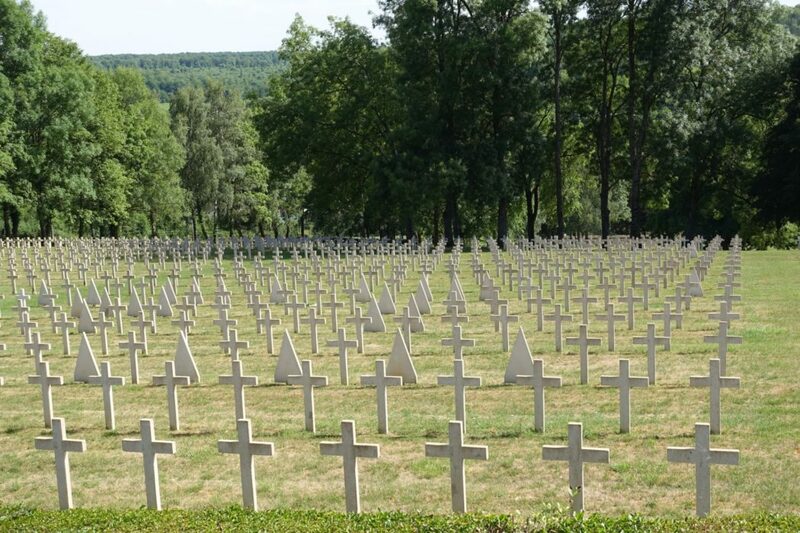 Pause to look at the names: the repetition of surnames offers searing insight into the effect of the wars upon people’s lives. The wars among European nations and people that marked the regions traversed by the GR5 were, in a fundamental sense, civil wars. 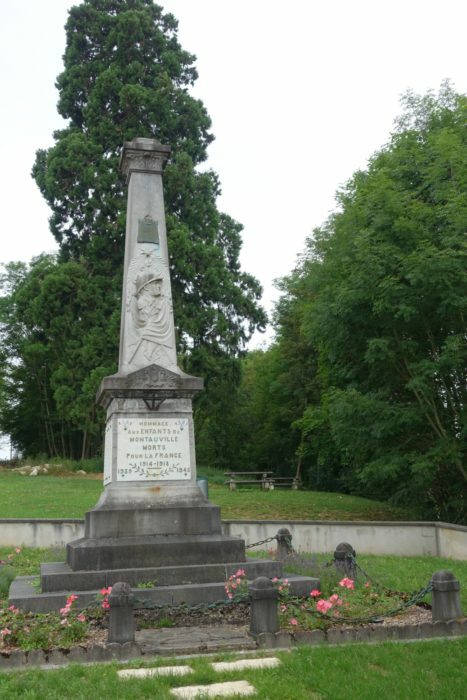 A war memorial beside the church in Burg Reuland (Wallonia) illustrates this point: it lists the names of soldiers killed during World War I, when Burg Reuland was German, and during World War II, when the village was Belgian. 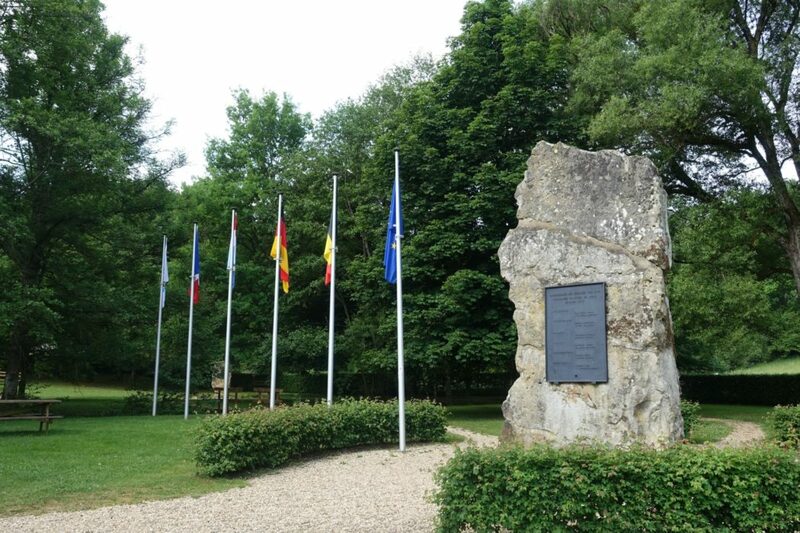 There is a more positive memorial near Ouren, where the borders of Belgium, Germany and Luxembourg meet; it commemorates the signature in 1957 of the Treaty of Rome, which established the European Economic Community, forerunner of the European Union. 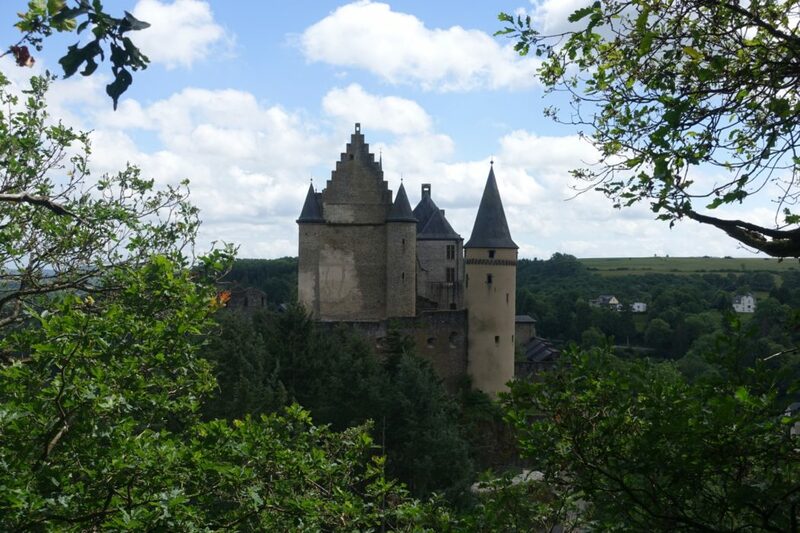 Further along, where the borders of Luxembourg, Germany and France meet, the GR5 passes through Schengen. The treaty signed here by five European nations in 1985 provided for the elimination of internal border checks. 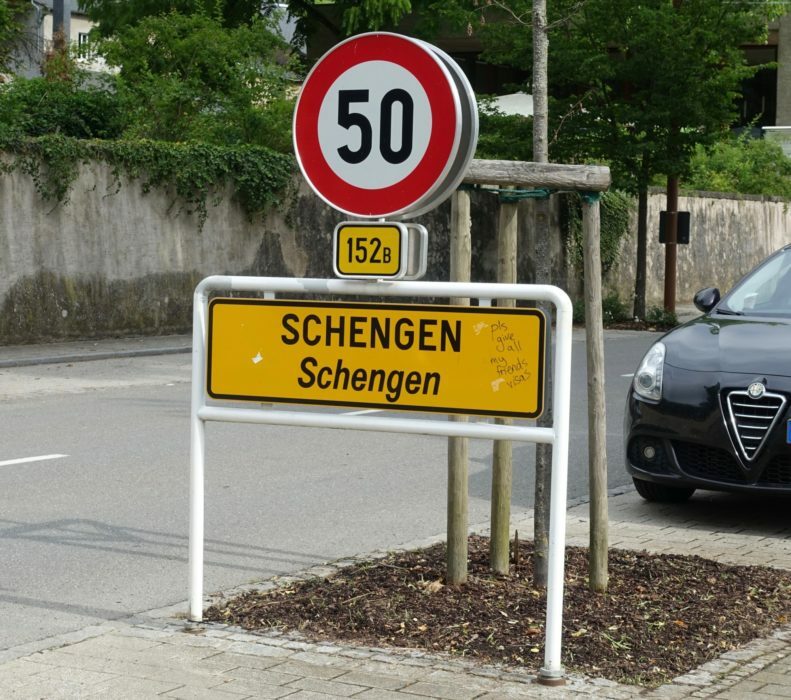 The Schengen Area now encompasses 26 European countries with a total population of more than 400 million. 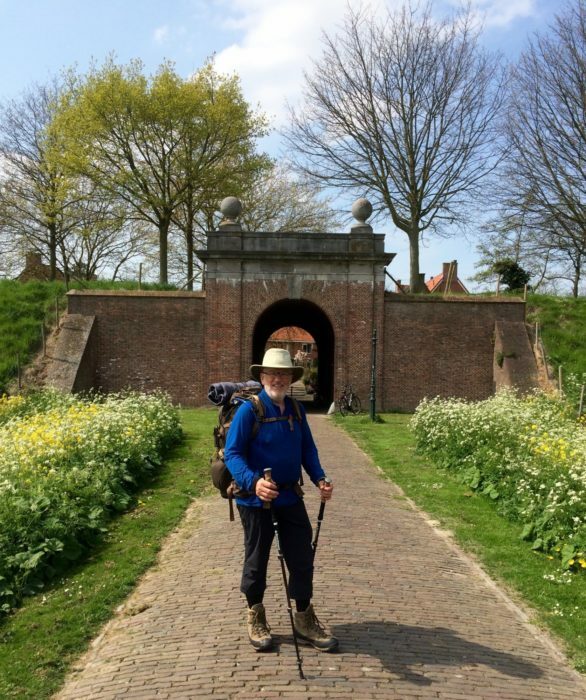 Unless circumstances change dramatically, you will not need to show a passport to cross any international border as you walk along the GR5 from Hoek van Holland to Schirmeck (and beyond).